When Maisy sets off to go camping in the country, it’s only natural that all her friends come along, too. But they soon find that pitching a tent is not an easy thing to do. Even if they do manage to keep the tent up, there’s the matter of fitting them all in ― Maisy, Charley, Cyril, Tallulah, and finally, the huge elephant, Eddie. What a squeezy squish-squash! Good night, campers! Uh-oh-what’s that popping sound? 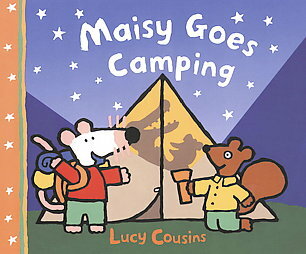 "Maisy Goes Camping" finds Maisy and her friends Cyril, Talluluah, Charley and Eddy going on a camping trip. Maisy is all packed and ready to go and they've found the perfect place to camp. Things become amusing, however, when the situation in the tent gets rather cramped, thanks to Eddy's large size. This is a simple, fun story. The illustrations in the Maisy books feature bright, simple patches of color inside large, dark lines. The text and story content are nice for bedtime.